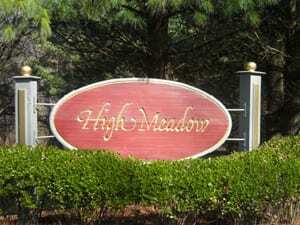 At the request of the High Meadow Condo Owners Association, and consent from the Board of Selectman and the Planning Commission, the WPCA has embarked on an initiative to study the engineering and costs of sewering the condo complexes bordered by the Railroad, Route 133 and Silvermine Road, thus including the Newbury Crossing and Ledgewood Condos. What was the status of the project Winter 2013? The Approval Process for a typical project is summarized on this site. In February, 2013, the project was brought before the Board of Selectman, then onto the Board of Finance for approval to float a bond. Bonding is the lowest cost of financing. Since the project is over $1MM, a Town wide vote was required. That happened May 2013 and was approved for bonding up to $2.5MM. With endorsement by the three affected condo associations, a commitment has been made to go forward. Engineering has been completed. The rather extensive application to the Wetlands Commission was approved after 6-months of negotiation. The project will likely be limited to the dry summer months, but this window is now past for 2013. There was also an issue with the granting of an easements that are now resolved preventing the project from moving forward. The line goes under the Railroad. The rail owners have asked for $80,000 for the privledge of using route at the so-called cattle-crossing archway. Additional value engineering work was done to secure additional construction bids for alternate routing. The alternate routing cost estimates were equal to the shortest wetland route, and will not have ongoing wetlands maintenance issues. What was the status of the project Fall 2014? The project was put out to bid and a construction contract awarded. The construction is underway since August. It will be a challenge to complete the digging required before the first snow falls. What is the status of the project Fall 2015? The project is completed. It is typical for a project of this magnitude to take 3-4 years from conception to completion. The project costs are funded by a Bond Anticipation Note (BAN), which will be eventually converted into a 20-year bond. The bond is paid by those benefited by the project, the condo owners. See an explanation Benefit Assessments. Be sure to review the Q&A page as well. Benefit Assessments calculations for this High Meadow, Newbury Crossing and Ledgewood project are provided for here by way of explanation and example. 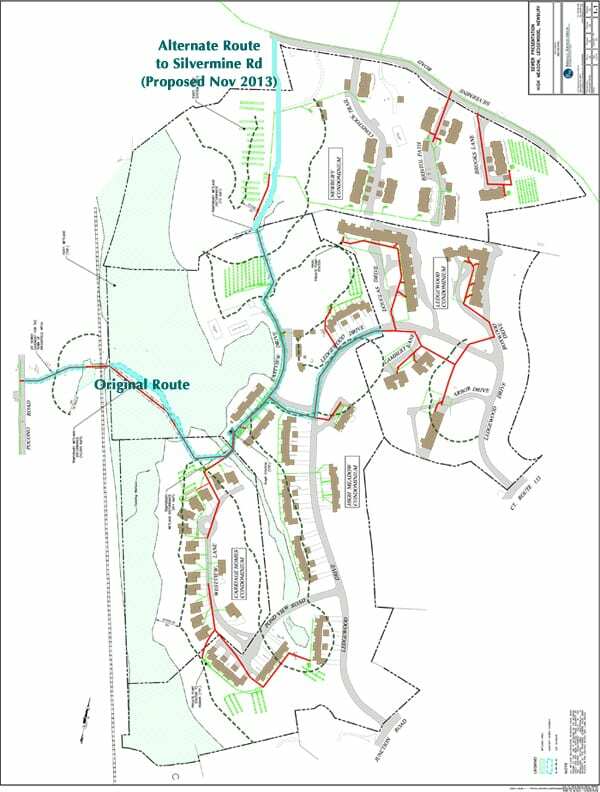 The map below is not easy to read on the web but gives a rough idea of the project site. The plan took advantage of some existing septic system piping. The green lines are new sewer lines. The shaded area is wetlands. The entire flow is proposed to go under the RR tracks into lines buried in Pocono Road almost directy in front of the Fire House. The red lines will be new installation inside the boundaries of each association and owned by the associations. The thicker bluish lines will be common, maintained and owned by the WPCA. The routing under a railroad bridge to Pocono Road is now rejected for the alternate route directly to Silvermine Road. See the narrative. The greenish areas are wetlands. The dash lines are bounded by wetlands regulations, but otherwise have no functional meaning. The boundries include unnamed water runoff creek beds outside of the defined wetlands, but under the jurisdiction of the Wetlands Commission.